PG54 have had a commercial relationship with Mel & Mal since before PG54 was created. While we do provide web related services to Mel and Mal, our continued friendship comes first. Mel and Mal, or Melanie and Malcolm, are a real team and prove the old saying that "Behind every good man is great woman". Mal "is front of house" and performs on T.V., at catering shows and exhibitions and also in stores up and down the country. Mel looks after the important stuff, like the site, and keep Mal in check and on time. The site has changed it's role over the years and is currently acting as a central repository for their unique recipes, reviews and recommendations. 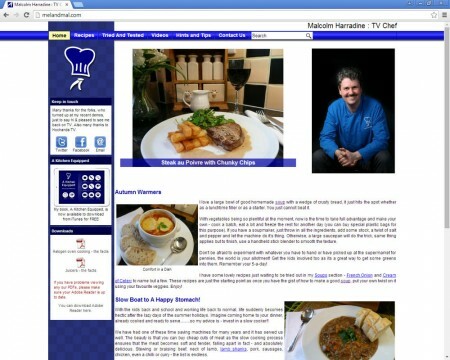 If you have any interest at all in cooking, take a look at their site and get some inspiration.